St. Edward speakers competing in the Scotus meet were, l.-r., Sophie Reeves, Maya Baker, Alias Schumacher, Gabby Muckey, Miranda Matchett and Mary Blankenship. 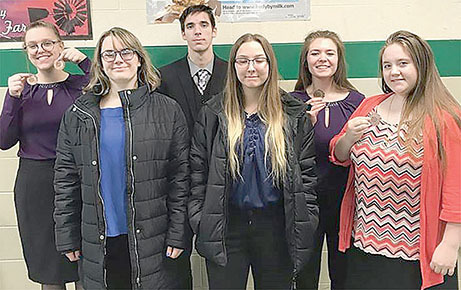 St. Edward speech team placed third among seven teams in the Columbus Scotus Speech Meet last Saturday, Jan. 19. Extemporaneous Speaking — Mary Blankenship, third, and Gabby Muckey, fifth.